Abstract: As the flow of cargo increases, intermodal container terminals receive larger workloads. Quay crane control machinery has to be prepared for rapid reloading. In this way, efficiency of cargo transportation can be maximized. This means that safety of cargo is pushed to the limit. 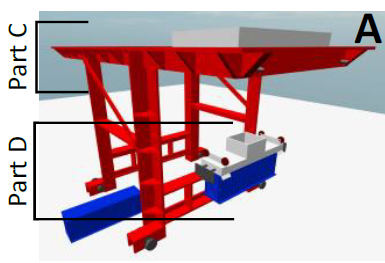 In this paper, a model of quay crane spreader for simulation and transients analysis is proposed. Mathematical model represents a crane spreader and lifting mechanism. The Lagrangian method is used for calculations. During the system simulation, trolley position and swing angle responses of the dynamics system, duration transient processes of trolley and spreader, have been acquired and analyzed. Simulation of the transients dynamics are presented, to analyze the model. Reference: A. Andziulis, T. Eglynas, M. Bogdevicius, R.R. Negenborn, M. Jusis. Dynamics and mathematical model of intermodal crane spreader transients. Ciencia e Tecnica Vitivinicola, vol. 31, no. 5, pp. 1-17, 2016.